Disclosure: This post is sponsored by Texas Department of Transportation; however, all thoughts and opinions expressed are my own. In Texas, texting while driving became illegal in 2017. That’s supposed to be common sense but also some people apply mascara, do WhatsApp, snack, sing-a-long or send snaps. Crazy, right? The HB 62 law is here to remind us about some behaviors behind the wheel that are not safe for us and our surroundings. As soon as I get in the car, I turn off my phone. It’s better to have my texts unread and get safely to my destination for my kids, my family and friends. Tweets, emails, texts, snaps — it can wait! Did you know that April is National Distracted Driving Awareness Month? It’s here to encourage Texans to recognize this new law and remember to put your phones away while driving and prioritize paying attention to the road. 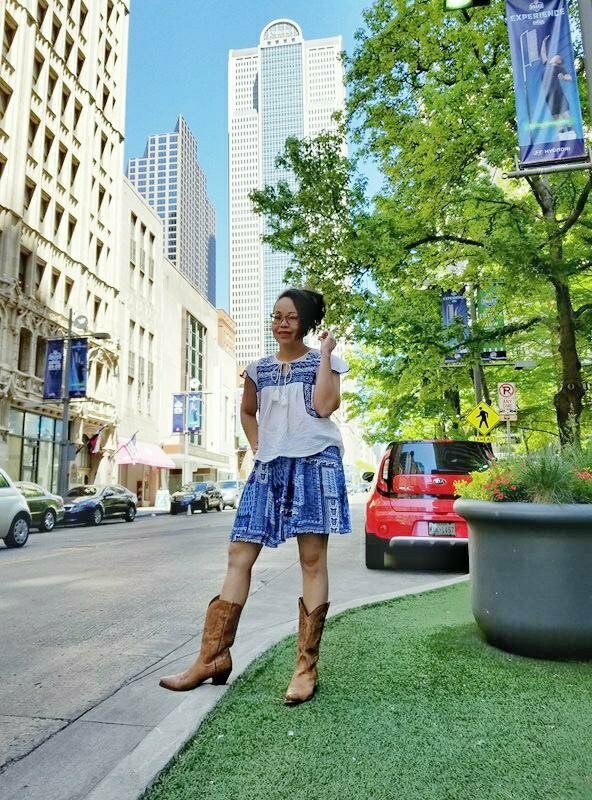 I’m excited to partner with TxDOT to please remind yourself and loved ones to keep your Heads up, Texas while driving and avoid any and all distractions.Here I am in one of my favorite spots in Dallas wearing handcrafted cowboys boots along with my own personal style.